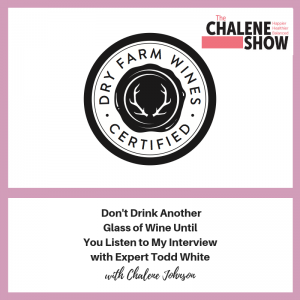 In this episode, I had the pleasure of interviewing wine expert Todd White of Dry Farm Wines. There are so many conflicting opinions when it comes to wine and health, and so naturally… I wanted clarification from Todd on the subject. I question Todd about his magical sugar-free, organic wine and the science backing what makes his wine unique and a healthy option. Dry Farm is the only wine my husband and I drink, and that is for a reason! Listen in to get all the deets on Dry Farm Wines and learn why Bret and I love it so much. Not only that, but you’ll also get some tips when it comes to what to look out for when shopping for your next bottle of wine. You’ll receive answers to commonly asked questions like: How much wine should one drink each day to reap benefits and not overdo it? What are sulfites and how are they used in wine? What should I look out for when shopping for a bottle of wine? And simply… is wine good for health? This is a special episode and I hope it clarifies any uncertainties you’ve had about wine for health. I hope this episode served you at a time in which you needed to hear it. Be sure to leave me your feedback (send me a message by clicking down below) if you enjoyed tuning in… I’d love to hear from you! Read More About Dry Farm Wines & Try it Out Today!